August Break: Ich sitze. – Sunshine. Whimsy. Tacos. We’ve all been these guys at some point in our lives. You get halfway through moving a big heavy object, and need to take a break. It’s nice when the thing you’re moving is this comfortable to sit on. Do you have any fun moving-house stories? August Break: Ice Cream Break! 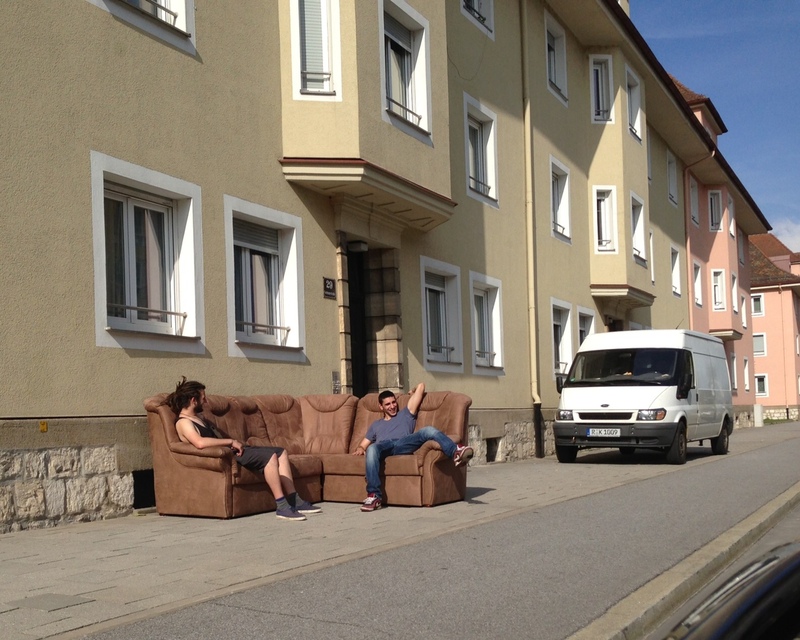 Plus, something about a couch on the street makes it extra comfortable! In my first apartment, the boys (my brothers, cousins, friends, miscellany) were complaining about carrying things up the stairs– especially this fridge that I wanted that they said would take three of them. So I used math, physics, and spare stuff around the place and moved it up by myself while they were on lunch break. It was way more elaborate than it needed to be, but it was worth it for the look on their faces when they saw I did it myself.